It’s easy to lose focus on long term goals when highly palatable, high calorie, low nutrient food is placed in front of you. Whether it’s alcohol, a giant burger & fries, pizza, etc. we often seem to forget the reason we started to focus on eating healthier. It’s not uncommon to feel powerless in these situations. There are two different meanings to this one. One is that food itself is made of chemicals that provide calories (a.k.a. energy) to your body that directly feeds into metabolism (the breakdown of food for energy). With this definition, unhealthy foods that don’t make your body feel well still provide energy but not in the way we normally think about it. The second way food provides energy is that when you eat foods that are in line with your body’s needs (giving you the macronutrients and micronutrients you need), you will have increased energy in the same way that eating food not aligned with your body’s needs (like high calorie, low nutrient foods) leave you feeling sluggish. Our brains first main source of energy is carbohydrates. Mental fatigue or fog can mean a few different things. Mental fatigue and fog may show up in a student or busy worker who forgets to eat. Mental fogginess can also show in people experiencing a food sensitivity, along with many other factors. While specific foods are worth looking into if you’re experiencing brain fog, eating too much sugar may impair memory functions and mood. It’s hard to be in a good mood when you feel crappy. I love hearing how much mood improves in clients I work with. One of my clients even said she’s a better, more patient, more loving person when she eats well to fuel her body well. How awesome is that?! No more crashes and hangry moods. Food is powerful! Carbohydrate-rich foods are associated with increased serotonin, a brain chemical linked to improved mood. Complex carbohydrates, such as whole grains, are healthier choices because they help stabilize blood sugar levels better than simple sugars. Foods that contain tryptophan (such as turkey, yogurt, and fish) are also associated with improved mood as the body converts tryptophan to serotonin. Talk to an athlete and they will tell you how much nutrition plays a role in not only their performance, but in recovery as well. Muscle breakdown is part of athletic endeavors and requires enough calories, amino acids from protein sources, refilled glycogen stores from carbohydrates, and micronutrients to work together in muscle recovery and growth. There are lots of ways to tackle performance nutrition and finding a plan that works for you is important. You don’t have to consider yourself an athlete to see improvement in everyday physical performance. You have the opportunity to impact sleep quality by making small nutrition changes. Women sleep better when having carbs closer to bedtime. This doesn’t mean you should have a bowl of ice cream every night, but instead, if you are reducing your total intake of carbs, it’s best to move some of them to your last meal or snack rather than ending the night with only fat and protein. You probably already know this, but alcohol does not promote healthy sleeping patterns. While alcohol might feel like it’s putting you to sleep better, it negatively affects sleep quality. Quality and quantity of hours are important in getting a good night’s sleep. Caffeine is another substance that affects sleep quality – even if it doesn’t effect sleep time. Switch to decaf in the afternoons if you need, and remember that decaf still has trace amounts of caffeine, and caffeine-free teas are better when the afternoon hits. What do you do if you need caffeine and it’s already the afternoon? Make nutrition changes that support better energy and go from there. This one is hard to test and might not be as scientifically validated as the above points, but choosing foods that fuel your body to perform well is something you should be proud of! Choosing foods that fuel you well physically and mentally can be freeing and empowering. It doesn’t have to be stressful, confusing, or anxiety-producing. I work with people all the time on how to reduce the anxiety around choosing foods that fit their goals without getting wrapped up in the details. This leads them to more confidence in their foods choices and more empowerment – something so important for long-term success. Note, this doesn’t mean you should feel shameful for eating fun foods that don’t exactly fit most definitions of “healthy.” We talk about consistency over here, not perfection. Listening to your body, being in touch with your feelings, having healthy coping skills when life happens and all the other stuff that plays a role into what you eat can be a chance of showing yourself self-care. Self-care gets tossed around everywhere these days, but it really is vital to you physical health, your mental health, and helps you show up for others better. Eating well tells your body that you see it, you hear it, and you’re going to take care of it. With all these possible immediate benefits, it makes it a little bit easier to choose foods to fuel you and promote self-care. While it’s not always beneficial to seek immediate benefits in other areas of our life, and while it’s great to have long-term healthy goals, it’s helpful to shift at least some of the focus to short-term benefits of healthy eating if it helps. Shifting your thinking into immediate benefits versus long-term is just part of the puzzle to having a healthy relationship with food and having a body and life you love. 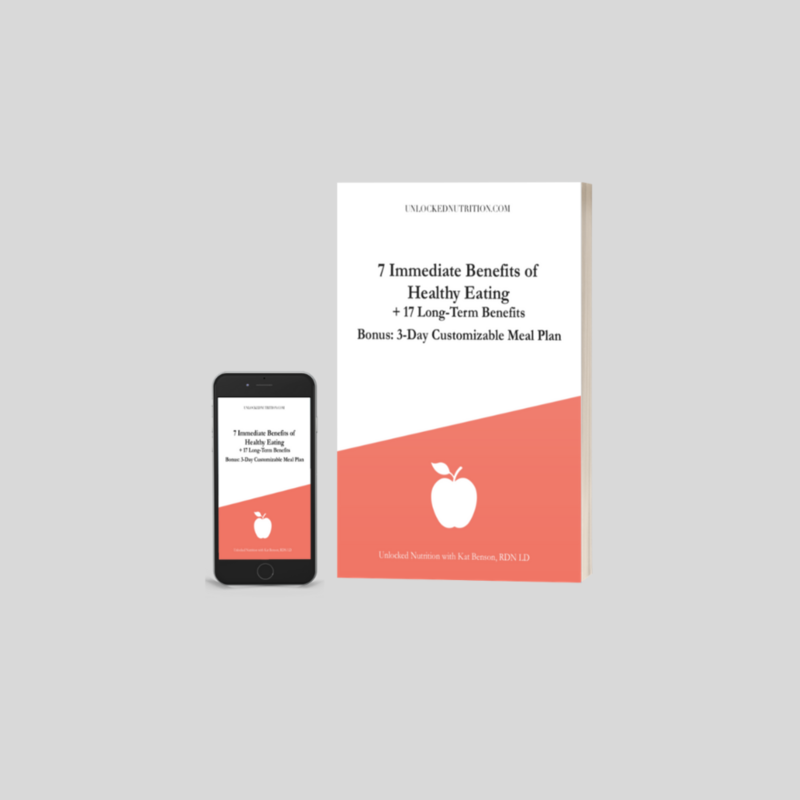 Now that we’ve uncovered some immediate benefits, let’s tap into some of the long-term benefits that eating well can have. But hold up! This is a pretty long article and I want you to know how to make simple changes that keep eating healthy a consistent practice, so you can stop falling off the yoyo dieting roller coaster. If you want the cliff notes version of this article as well as a free 3-DAY MEAL PLAN that’s customizable to you with examples, click here to grab my FREE guide. I have a couple dietitian friends who specialize in helping people get clearer skin by changing their diet. It’s amazing how much nutrition plays a role in skin care – but if you think about, we expect nutrition to play roles in our other organs, so why would the skin, part of the largest organ, be any different? Small dietary changes are enough for many people to see a change in their skin, from acne to eczema. Making sure you get enough water for healthy, clear skin is usually the first recommendation. Beyond that, it’s important to get in enough fruits and vegetables rich in plant nutrients that support healthy skin and make sure any food sensitivities are appropriately taken care of. This goes along with the immediate improved mental performance benefit, but this takes it to another level and is more long-term. There are some kinds of food that impact thinking and can be used to add more focused thinking even beyond normal, improved mental performance. The improved mental performance mentioned above is more about macronutrient balance, whereas clearer thinking is more about specific foods beyond macros. Many people, including myself, find that MCT oils can give you a clear thinking mind, even when just a little is added to food/drinks. Often when I’m working on a big project, I’ll make myself a cup of coffee mixed with grassfed butter and MCT oils. I don’t drink it everyday, for various reasons, but when I need a little extra mental kick, I do! This isn’t usually seen in the beginning stages of making big healthy eating changes. In fact, in the beginning, it’s often the opposite. But when the liver and kidneys naturally detox, reduction of cravings are one of the first things people experience. And if not, cravings of unhealthy food are often a sign of being on the blood sugar roller coaster, poor insulin sensitivities, and other issues that can be addressed. On the flip side, after reducing intake of unhealthy foods and improved intake of healthier foods, you might notice more cravings for healthy foods – your body know what is making it feel good, and will tell you to get more in. Nutrition plays a huge role in digestion and is something most people take for granted. Working with clients to improve their digestion is one of the most rewarding experiences because of how much it impacts and improves their quality of life. Being able to identify food sensitivities take patience, but is so worth doing. Having a healthy digestive schedule is not only important for gut health, but also for overall body health. Having a healthy weight for you (a natural set point weight) is a side effect of not just a healthy intake, but involves many different factors. For some, that might mean some healthy weight loss, for others it might be healthy weight gain. And for others, not much change. Either way, consistent healthy eating will promote weight at which your body is able to thrive and carry you through life. Having poor insulin (a naturally occurring hormone) sensitivity essentially makes it harder for the body to burn sugar in the bloodstream, allowing it to build up in your bloodstream – not good. We can’t always prevent conditions like type 2 diabetes (and we shouldn’t blame diet on all cases of it), but we can take control over most environmental factors, like food choices. It’s a privilege to do so, but that shouldn’t keep you from taking care of yourself if you can. Even someone who does have type 2 diabetes can usually improve their insulin sensitivity and possibly increase the time before having to rely on prescribed insulin. Taking prescribed insulin is a life-saving privilege, but can be expensive and time-consuming. We can’t always prevent disease. There are many factors that determine disease and the progression of them. But we can play our role and do as much as we can to promote a healthy body, as environmental and behavioral factors are factors in disease. That is part of the reason why I will never stop saying that food is medicine. Think of how we drive a car. Unfortunately, we can’t prevent 100% of accidents, but we can try to do lots of things to reduce the chances of an accident occurring. Some people who develop conditions, like type 2 diabetes, and don’t manage it well, end up with other complications like limb loss, kidney disease, eye problems, and more. Most of these complications are reduced when the diet (and meds) help. There are many factors that play into complications and why they happen, but again, let’s focus on what you can do, and that is to choose a healthy diet (whatever that looks like for you). Getting on the blood sugar roller coaster is that quick surge of energy with a pretty quick drop that most of us have experienced at one time or another. How we pair foods together plays a huge role in whether or not we jump on the blood sugar roller coaster. Pairing foods together to support healthy blood sugar levels is not hard! And you don’t have to be a nutrition-guru to do it. For the best, and most simple, ways to balance foods for healthy blood sugar levels, check out my 3-DAY MEAL PLAN that’s customizable to you with examples, click here to grab my FREE guide. Nutrition plays a huge role, not only in physical growth, and mental health, but in behavior as well. As a parent or guardian, you have direct impact on the nutrition of your kids from conception and throughout life. Of course, getting kids to eat what you want them to is another story. One of the best ways to promote healthy food intake is to be an example. And remember, it can take more than 11 times for a kid to actually like new foods. Don’t give up, and don’t get too frustrated. More and more research is coming out showing the impact on health that grandparents have on their grandchildren. An interesting note is that when girls are born, they have all the eggs they will ever have. This means that the eggs in the baby girl were formed inside the grandmother at one point during development. Pregnant women, not only have the opportunity to impact their daughter with good nutrition, but also the following generation. How amazing is that?! We all know that a diet high in sugar can cause plaque build-up and tooth decay, but high-fiber fruits and vegetables require lots of chewing and help stimulate saliva with antimicrobials to reduce bacteria in the mouth. It’s not uncommon for people who switch from a standard American diet to a healthy diet to see a reduction in cavities and an overall increase in healthier teeth. Did you know that a diet high in fruits and vegetables can significantly change gum health for the better? It’s true! There are many studies showing a reverse in certain gum diseases when fruit and vegetable concentrates are added to the diet alongside healthy hygiene habits. Harvard researchers have also found that fish rich in omega-3 fatty acids may reduce rates of gum disease due to reduced inflammation. There’s a big link in food consumption and chronic inflammation. While short term inflammation can be a good thing, chronic and excess inflammation in the body are associated with chronic conditions, like type 2 diabetes, heart disease, and other conditions. It’s important not to take things to the extreme. You can still have a healthy diet and healthy body and still include some of the foods in the inflammatory list at times. I still eat red meat and I enjoy pastries at times. Just make sure you still get in the healthier foods too to help battle any inflammation! Working out and training is a stress to the body – good stress, but stress nonetheless. Making sure to eat enough food and enough anti-inflammatory foods are key to improving recovery between training days. There’s a science to making sure you eat the right foods before and after training to maximize the sport or aesthetic goals. IronMVMNT was created by myself, Kat Benson, RDN and one of my good friends. It’s an online nutrition coaching platform and specializes in behaviorism-focused coaching – nutrition coaching focused on long-term results and can help improve recovery. Having balanced, healthy meals and snacks (if needed), can allow you to focus well and have enough energy to be able to knock out everything you need to do so you have less stress. Having a healthy diet also helps keep hormone levels in check. Omega-3 fatty acids protect against spikes in stress hormones, like cortisol. Vitamin C has been shown to reduce stress hormones while protecting the immune system. Magnesium, found in nuts and spinach, also helps to keep stress at manageable levels. Like the prevention of disease, we can’t always “eat to live longer”. There will always be outliers, but we can take the steps that correlate to longer, healthier lives. Eating healthy doesn’t mean eating to a specific set of rules. It’s just about identifying hunger cues, eating when hungry, honoring fullness, satisfaction, and satiety, and giving thought to your food selection without being so wary and stressed that you’ll miss out on the enjoyment food can bring. In short, healthy eating is flexible. It varies in response to your hunger, your schedule, your proximity to food and your feelings. Stressing about having the perfect diet isn’t exactly longevity-promoting. Do you know of another benefit not listed? Let me know in the comments below!